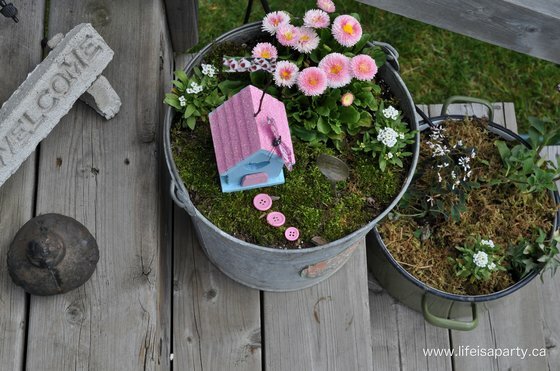 It’s that time of the year again, where my mind starts thinking about fairies and building little fairy gardens. It’s becoming a bit of a tradition for my girls and I to make them each spring -see last year’s here, and here, and the year before that here. 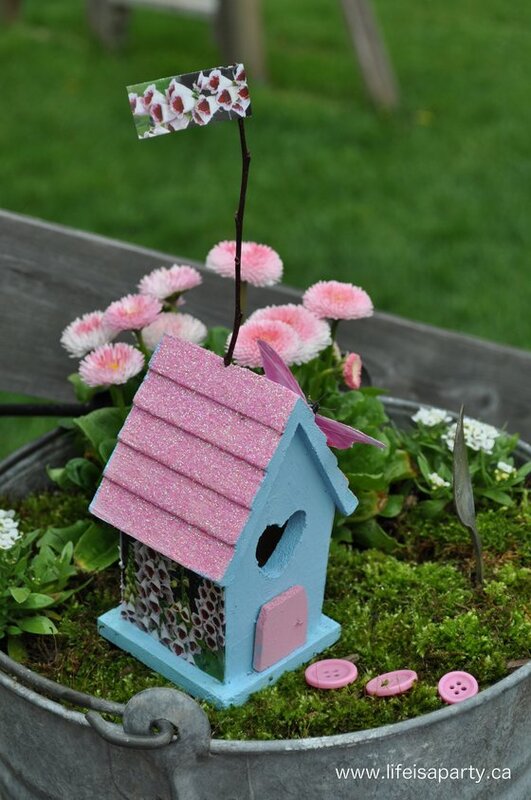 I usually start out with little dollar store bird houses, and make a few minor adjustments to make them into the perfect little houses for fairies. 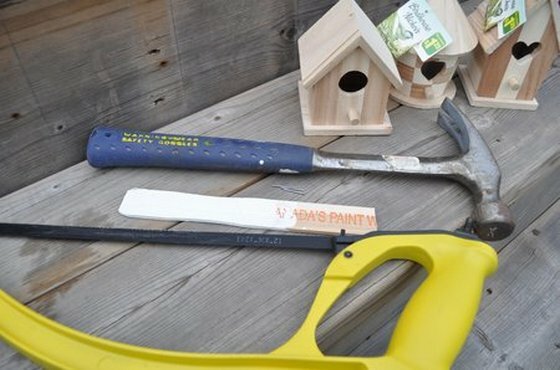 Start by using a little saw to cut off the perch, and then use your saw to cut off the end of a regular old paint stick and attach it with a little finishing nail -leaving it sticking out a little for the perfect door knob. 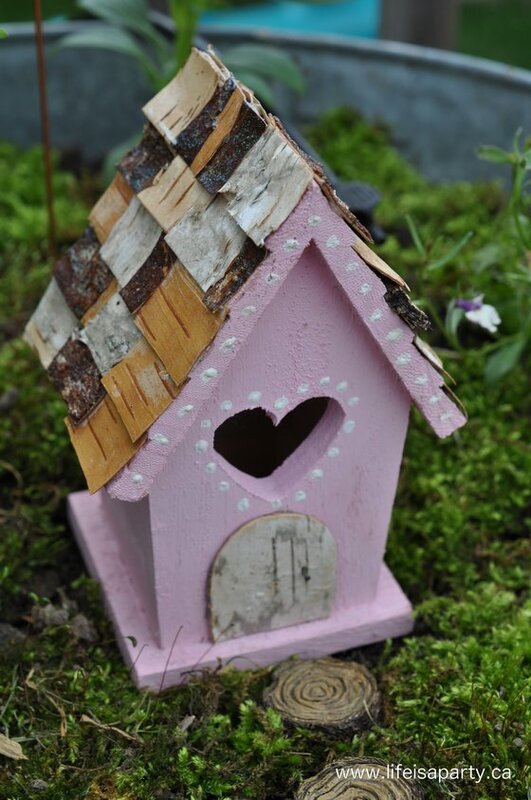 Then we usually paint them in pretty colours and add a little glitter here and there for a the perfect fairy touch. This year I wanted to change it up a little and I’ve added a few more fun details to the house construction. I may or may not have watched a few too many Tinker Bell movies over the last few years, and I found myself thinking “what would the fairies use”? They seem to use anything they can find -at least in the movies, so I incorporated a few things they might have on hand too. The first house I made this year has a pine cone shingle roof. I just bent little pieces of pinecone off with my fingers, and hot glued them in an overlapping shingle style to the roof. Afterward I gave it a coat of glitter paint for a little fairy sparkle. 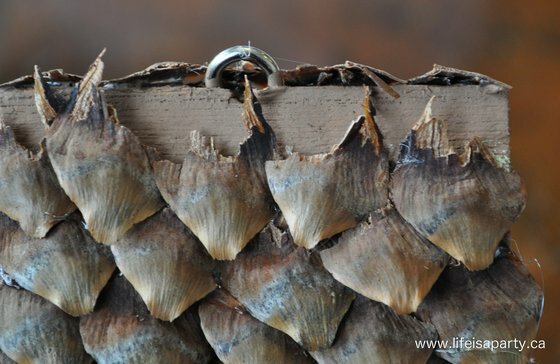 The finishing touch was a front door made of twigs with a tiny little rock handle glued on. For the second one, I made some sweet little shingles out of some birch bark, trying to alternate colours and textures for a little variation. The door of this one is another piece of birch bark. It’s really easy to work with, and all attached with hot glue, and finished with some glitter paint. The third one might be my very favourite, with three sides of it covered in a seed package. I just trimmed them to size and modge-podged them on. This one has a full glitter roof too. After the houses were made it was time to place them into the gardens. I like using old galvanized steel, and enamel ware containers I’ve picked up mostly at antique shows. Just make sure to add some holes with a nail and hammer first for drainage. 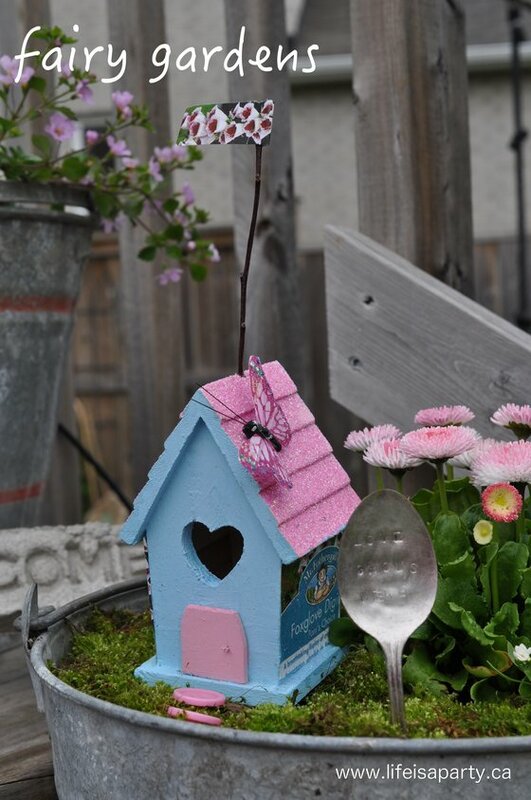 I’ve used some sweet little annuls in my gardens this year -just try and pick flowers with smallish blooms, and remember they’ll grow, so give them some room, and be sure to leave space for the houses and accessories too. 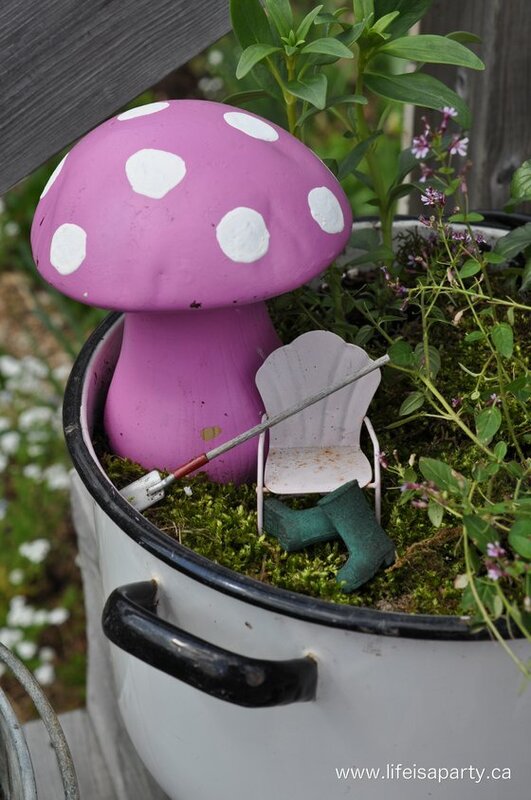 After the plants are in, I like to add moss to mine to make the fairies yard. I just dug up some from a shady spot in our side yard where it was growing. Then it’s time to add your houses, and pathways, and fun little accessories. I used some that I already had from other years, and added a few new ones too. I was so pleased to see that Michaels is carrying some miniatures now. 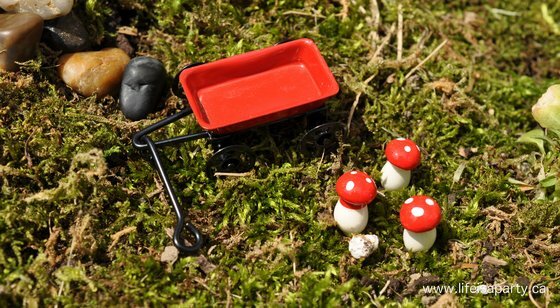 We found this cute wagon and mushrooms there. 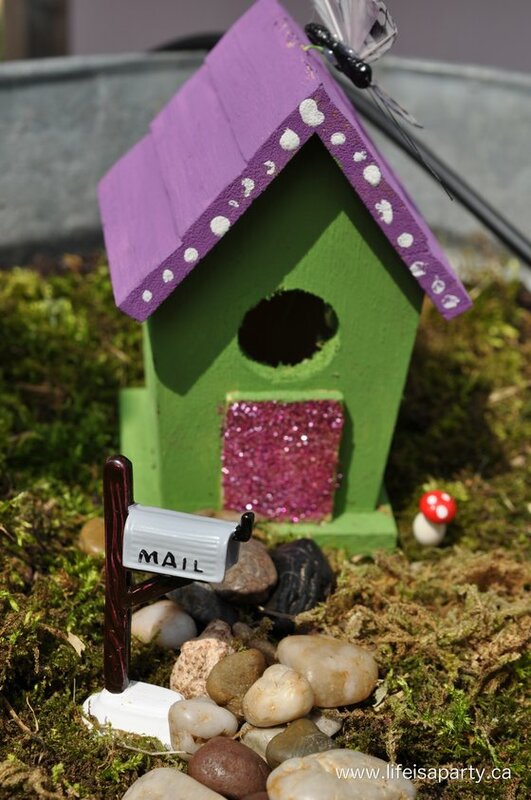 I also found this little mailbox there too. 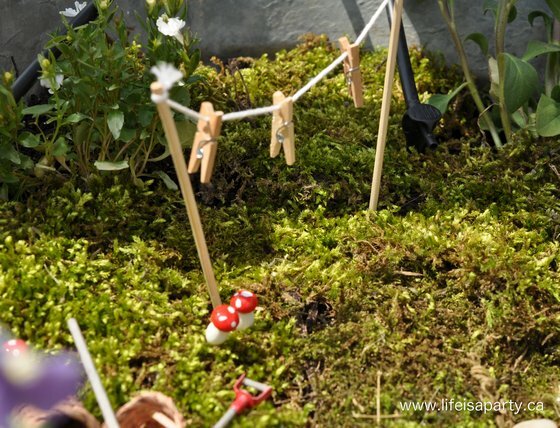 And, every busy fairy household needs a clothesline for the washing. I came up with a few new accessories too. I made this sweet little arbour by hot gluing a few twigs together, I think it makes a sweet garden entrance. 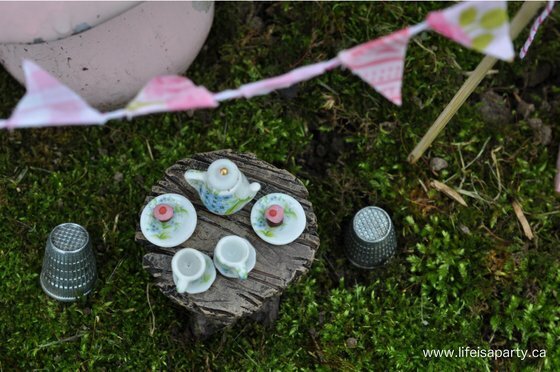 The perfect entrance to a little tea party in the garden. I made the cupcakes last year out of some polymer clay and they really held up great…makes me think about what else I could make. The china tea set is from a miniature doll house store, I’ve had it out for three years now and it still looks great. The table is a new addition from a local nursery selling some garden furniture this year, and what better seats than a couple of thimbles. 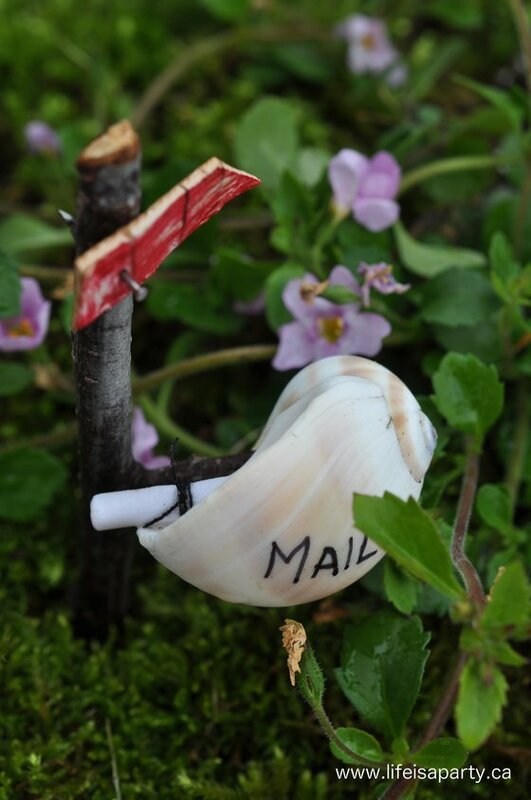 The shell mail box is new too. 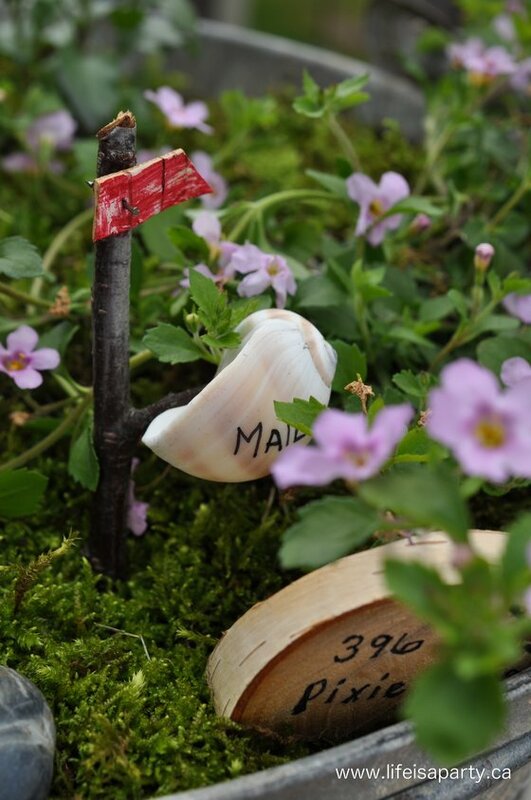 I used a sea shell, and added the flag with a little piece of birch bark, coloured red with a sharpie and hammered in place with a little finishing nail. If the flags up -you’ve got mail! 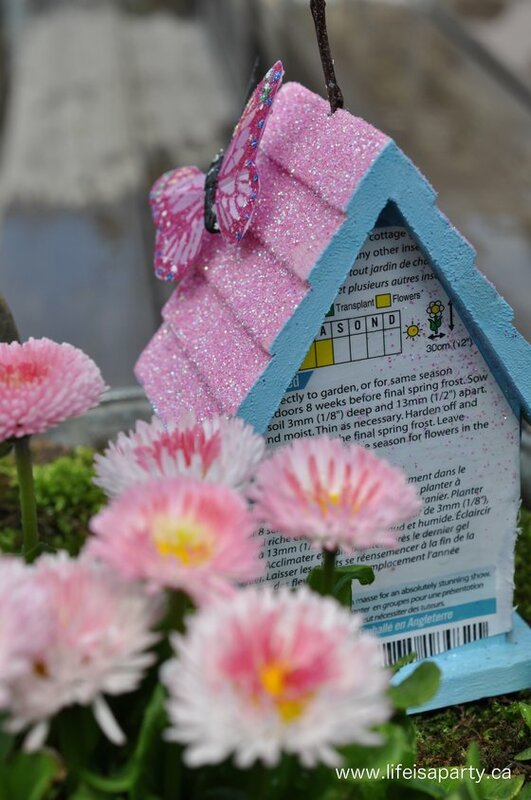 And, every house needs a little house number so your friends can find you when they drop by. 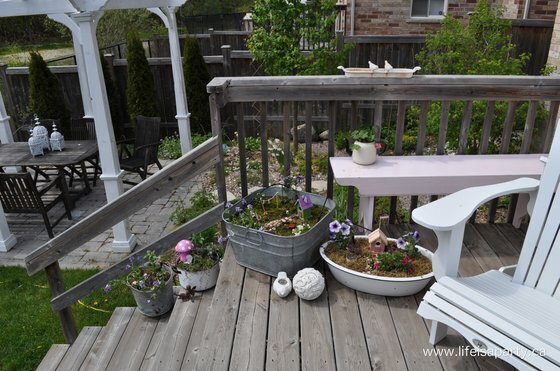 I love making these little gardens and using them in pots along with some other pots on my deck. 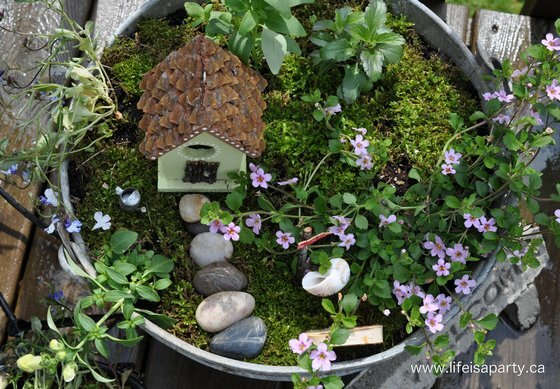 With miniature fairy gardens, life really is a party! This post is linked up at The Magic Onion’s Fairy Garden Contest, The Outdoor Extravaganza Link Party, The Makers Link Party, Link Party Palooza, Weekend re-Treat Link Party, The Inspiration Gallery, The Makers Link Party, and The Party Bunch. 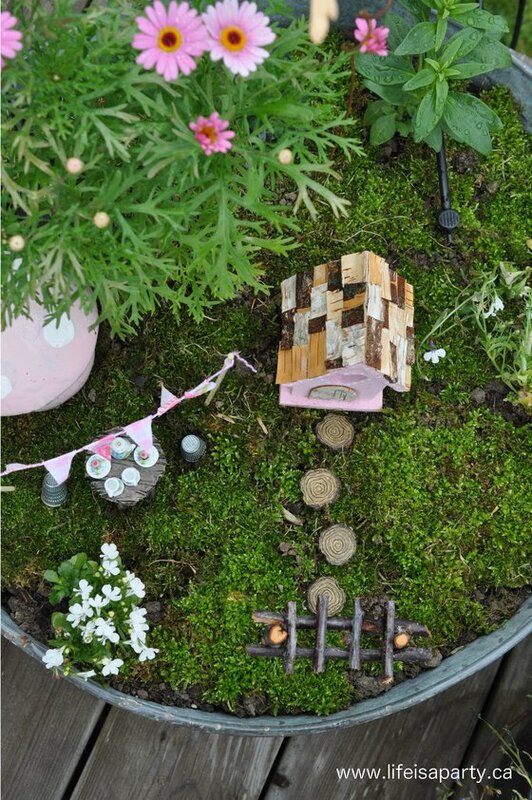 This fairy garden is so adorable. I totally enjoyed all of the photographs! I am inspired to make my own one day! Pinning! 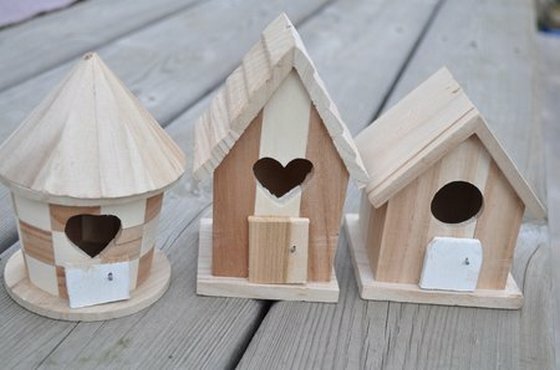 I saw this on the Re-Treat link up and had to come see what you’ve done! I’m so eager to buy a house this year just so I have a space to do things like this! Your attention to detail is absolutely amazing! Pinned! Oh, these are sooooo cute. Thanks for sharing! I bet my little girls would love these. Oh. My. Gosh. That is the cutest thing I’ve ever seen! I must make one now! Goodness those are adorable! 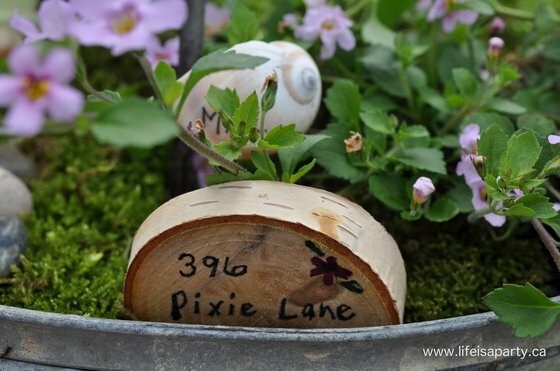 Why didn’t I know about fairy gardens when my girls were young? 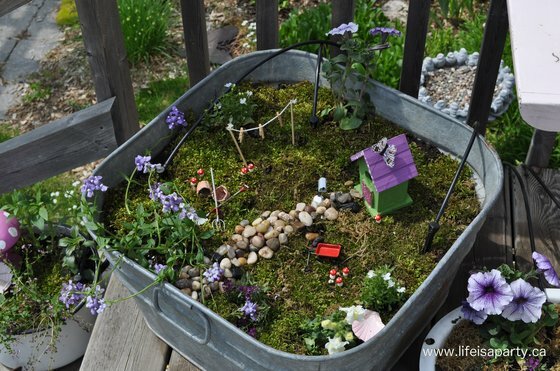 very cute collection of fairy gardens. 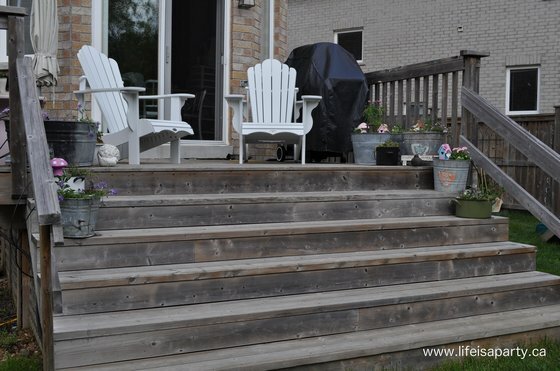 I like how you arranged them on your steps. This is just an incredibly fun idea. I love it! 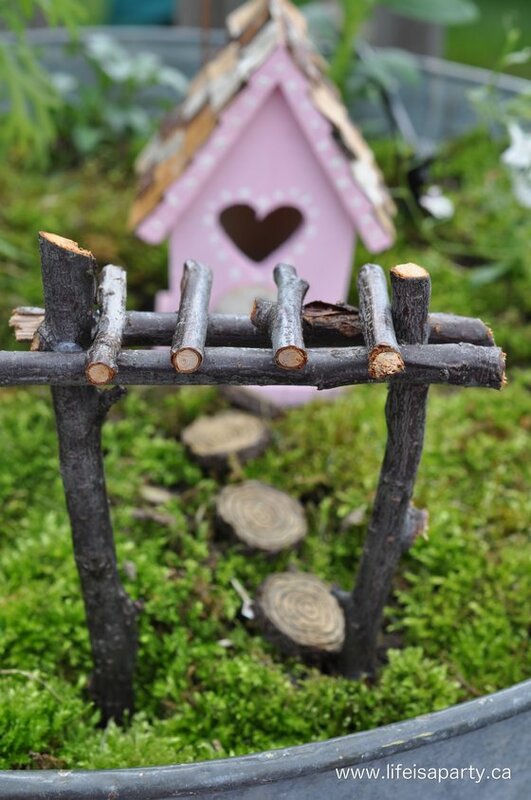 All the attention to detail, the way you have created a little village… just perfect! 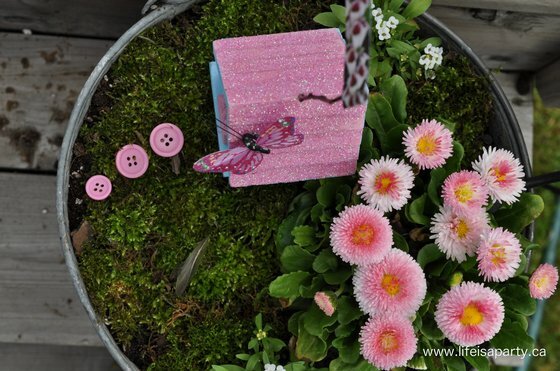 I love each an d every one of them…and love the fact that you made most of the Fairy Garden embellishments yourself! One question; did you somehow drill oles in the galvanized containers? 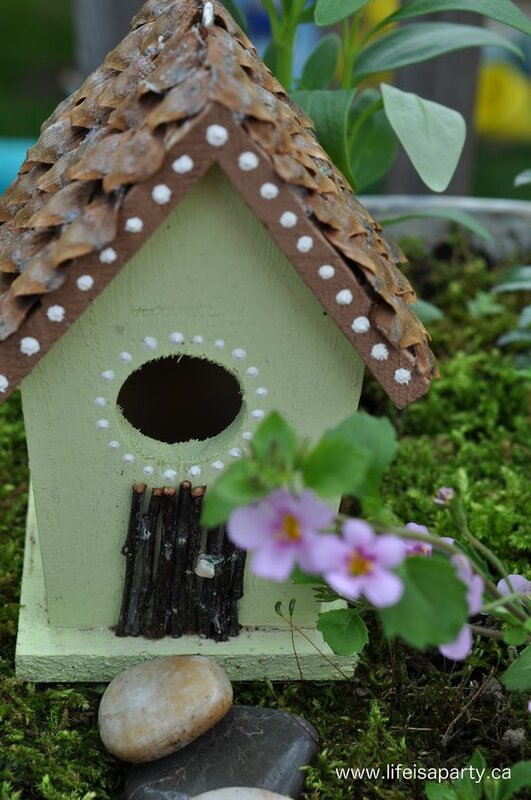 Love your wonderful, imaginative fairy gardens. I hope to make one before the summer is over.